I first discovered the benefits of essential oils when I was looking for relief from noise sensitivity related to PTSD and fibromyalgia. They’re both conditions that traditional medicine is flummoxed by, and it can be very frustrating. It’s easy to feel overwhelmed and helpless. But aromatherapy can be a blessing in situations like mine. I combed through the best essential oils books I could find, which is when I learned that essential oils have numerous uses outside medical ones, from pet care to household cleaning. If you’re new to essential oils and aromatherapy, here’s a guide to the best aromatherapy books for getting started, and to have around the house for whenever you may need them. This book is a handy basic guide in three sections: fundamentals of essential oils and how they work, practical aspects of acquisition and storage, and finally recipes for blending them in their most effective combinations. The first section helps to understand how essential oils have been used historically, which makes it clear that these arts have always existed in parallel with Western medicine. The second helps prevent mistakes like buying non-medical grade oils for the purpose of ingesting (by the way: don’t do this). But the best thing for me about this book is the way the recipes are indexed by the dominant essential oil in them, which makes it very easy to find exactly what you can put together with what you have in your house. It includes recipes for specific ailments, such as sore throat and even bruises. A great big recipe guide for practically every ailment in daily life. This book is inexpensive and yet highly informative and well organized, allowing you to search the index either by oil and usage or by conditions they may treat, from a cough to diabetes. With a reassuring style, it is very informative about all the interactions the oils may have. It also cautions you against common mistakes (a lot!). This is an excellent book for expanding your knowledge on how the oils interact with one another and with yourself to tweak what you need. This colorful and easy-to-follow guide lays out detailed profiles of 15 essential oils in particular that it deems most effective and versatile. It provides great charts that help you decide how many drops you may need for your purpose, depending on whether you’re using a carrier liquid for example, or what substitutions you can use. It’s also encouraging as it reminds you to don’t have to follow the exact recipe (if you’re missing one of the oils for example) for the remedy to be effective. If you’re like me, you know when your beloved pupper or catto is ailing, and just like people, there are times when traditional medicine can’t help them. This book carefully breaks down how essential oils and Chinese medicine can help pets, from a scientific and practical perspective. The best thing about this book for me is that it gives tips on recognizing stress in animals, which can not only let you know when they need some essential oil help but also when it’s not working for them. While the previous book focused exclusively on essential oils, this is a veterinarian-guided examination of holistic and non-traditional medicine for dogs and cats. While the focus is, of course, the science of healing pets, the authors are obviously very caring pet owners themselves, who understand that – like humans – one important component of pet healing is psychological. Essential oils can have similar mood benefits toward animals as humans, so this book can be a great resource for any pet parent. There are many reasons I love this book, starting with its comforting and yet scientifically informed approach. I am a runner who frequently struggles with digestive issues related to SIBO, or small intestinal bacterial overgrowth, something very common among those who experience any long-term psychological stress. Two chapters in this book, Essential Oils for Athletes and Candida, seem like they could have been written specifically for me. This book reassuringly presents solutions to everyday issues of mood and health, especially those that traditional medicine struggles with. The author did in-depth research to find exactly how essential oils benefit us and presents it in a clear and supportive way. This book, written by an author with a Ph.D. in chemistry, concentrates on the exact science of how essential oils can help. The author began an interest in essential oils when he was diagnosed with hepatitis, and this book provides solutions to conditions that others do not attempt due to their complexity, such as liver detoxification and preventing UV damage. At every stage, the book gives notes and opportunities for further reading, plus a useful glossary of scientific terms, so if you are interested in healing yourself or your family with precision, this is an excellent choice. This book is great for any parent or caregiver and their children, although a large section does focus on specific blends for women. But as any parent knows, kids have their own particular ways of getting hurt and sick, and tend to do it on a frequent basis. From household cleaning to stress management, this covers almost every daily worry that stay-at-home parents may have. Personally, the thing I like best is the focus on self-care, which many parents neglect in favor of getting their children where they need to be, making them food or responding to the trauma of the moment. The book is comprehensive, so for most parents, this may be the perfect all around essential oil reference around your home. This book focuses on pregnancy, newborn and postnatal care. It’s divided into three very useful sections: safety guidelines and use, recipes, and finally in-depth profiles of individual essential oils. I appreciate this order because if we’re honest, it’s the recipes we care about. Once we’re soothed and happy from our favorite essential oil blend, we have a bit more leeway to care about the detailed usage of lavender and clary sage. 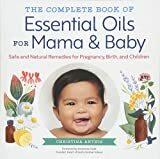 This book is a very easy read, with useful charts for how much concentration of oil to use based on the age of a newborn, and even has a section on essential oils to help ease labor. For any parent currently pregnant or recently having given birth, this is a wonderful reference. Written by a Ph.D. in complementary health, this extremely thorough volume is clear and easy to read, and easy to find your desired subject either by essential oil or remedy. Much like a good encyclopedia, the book is relatively heavy and has fine print, but as a result is able to pack much more information than even the best essential oils books. Since many of the recipes call for a variety of oils, this is a good volume to have if you already have a brace of your favorite oils. The other advantage of this book is that it clears up common areas of contention concerning essential oils, and is very well based in science. My favorite thing about this particular book is the way it allows you to search more generally than a specific malady, but by area of the body or health instead, such as digestive system, skin, and even endocrine system. You may know where something is wrong after all, but not the name of your own condition. This book also errs on the side of caution, so if one study finds that some people may have an adverse reaction to a particular oil, concentration or blend, it will caution against that. This makes it great for beginners, who definitely don’t want to have a bad experience early on and give up. This book also contains numerous illustrations of the plants themselves, which gives you a connection to the original plant. This is a beautiful book that is highly engaging every time you open it, with color pictures of plants and bright print. It was written as a joint effort by a naturopath and homeopath, an aromatherapist and a journalist who advocates the safe use of essential oils. Likely because of this, there are warnings for each oil, such as those that may be harmful for pregnant users or those who experience seizures. It contains profiles on 88 essential oils, far more than most. The only possible downside is that the oils are organized by their Latin name, rather than English, but personally, I find this makes me feel even more connected to the plants, knowing how they are related to one another. I hope you enjoyed this list, and that you were able to find just what you may need. I also hope it’s clear that while it may be hard for you for whatever reason to get help from traditional medicine, like me, there are things you can do to improve your quality of life. Again, essential oils may not be able to solve every problem in your life, but the act of taking control and of boosting your mood can make a huge difference. Having a book in your house that can present a solution to a pernicious problem, especially one like anxiety or depression for which even the act of self-care can be transformative, can empower you and give you the tools to take charge of your life and health. Please let us know if you have any questions or comments about this article, and we hope to see you in the next one. If you liked it, feel free to share this article with others who may be helped by it.